The site of the former “Joseph Proudman Oceanographic Laboratory” is for sale. The land – where the Joseph Proudman Building stood for a little while – is being marketed as a “development opportunity”. If you are thinking about making a bid, read this first. It will help with your “due diligence”. The vendor, the Natural Environment Research Council (NERC), is only in a position to offer the leasehold. The freehold is retained by Wirral Council, who can veto a transfer of the lease. To do anything with the land, the purchaser will have to re-negotiate the lease or acquire the freehold. The next few days will be critical for the future of Bidston Lighthouse, Bidston Observatory and Bidston Hill. It could go two ways. In one possible future, the land is used for the amenity of visitors to Bidston Lighthouse, Observatory and Hill. Open-air events are held on the site. Bidston Observatory is re-invented as an artistic research centre, incorporating a permanent exhibition about its scientific heritage. Bidston Lighthouse becomes self-sustaining as a place to visit. This is the future we dream about. We have, of course, made our own bid to acquire the land for this very purpose. In the other possible future, a developer or property speculator succeeds in acquiring the land. A long, drawn-out battle with local pressure groups, including ourselves, ensues. The developer might eventually obtain planning permission and listed buildings consent for some kind of development on the site. Let’s say its a residential development (which would also require change-of-use). Wilding Way would probably need to be widened, creating a danger to wildlife and dog-walkers, who stop using the northern end of Bidston Hill. You can see where this leads: Bidston Hill is sacrificed to meet the government’s targets for new housing. The prospect of public-facing, sustainable uses for the Lighthouse and Observatory is compromised. Maybe the Lighthouse and Observatory struggle on, or maybe they don’t. Of course, the developer might ultimately lose the battle for planning permission. Maybe they sit on the land for a few years, letting it go to seed. Fly-tippers take advantage. No-one visits the Lighthouse or Observatory. Everyone is out of pocket (except the lawyers). Everyone suffers. The land was once the kitchen gardens of Bidston Lighthouse. Its official postal address is 4 Lighthouse Cottages, CH43 7RA. An oceanographic research facility, latterly called the Joseph Proudman Building, stood on the site from the 1970s until its demolition in 2013. Since the Joseph Proudman Building was demolished, the land has been used from time to time by picknickers, dog-walkers and mountain bike enthusiasts, as an exercise ground by local schools and fitness fanatics, not to mention fly-tippers. Hedgehogs, foxes, owls, kestrels, woodpeckers and other wildlife have been seen on the site. The land is enclosed on two sides by a sandstone wall. The wall is a grade-II listed building in its own right, and the land is within its curtilage. The same wall encloses Bidston Lighthouse and Bidston Observatory, which are also grade-II listed. All three listed buildings were designed by George Fosbery Lyster, Engineer-in-Chief to the Mersey Docks and Harbour Board. Every stone on the site was locally quarried, and every stone is exactly where Lyster placed it a century-and-a-half ago. There is no conceivable development that would not diminish the group value of the site. The land was originally part of the title of Bidston Lighthouse when the Mersey Docks and Harbour Board sold the Lighthouse to the Birkenhead Corporation in 1935. At the time, the minutes of the Corporation said: “By this purchase the land would be available for all future generations for recreational purposes”. This intention was reflected both in the price – a modest £1000 – and in a restrictive covenant prohibiting new buildings. This covenant still attaches to the freehold title of the land in question, but it is not mentioned in the leasehold title. The covenant has not been tested in the courts – yet. The drains of Bidston Lighthouse and Cottages run beneath the Proudman land. The route of these drains is not known by Unitied Utilities. The western boundary of the land is disputed. The owners of Bidston Lighthouse claim an easement over the land in order to access their outbuilding, originally a coal-store and toilet block, and later a hazardous waste store. The single-track access road, Wilding Way, is owned by Wirral Council, but it is not adopted. It is not a public highway. It doubles as a public footpath for most of its length. It is crossed by dog-walkers, horse-riders and wildlife. The land comes with no rights over that part of the access road that extends beyond its western boundary. So without the willing co-operation of the Lighthouse and Observatory, the developer’s vehicles would have to turn within the boundaries of the land being developed. This entry was posted in Bidston Hill, Lighthouse, News and tagged Bidston, BidstonHill, BidstonLighthouse, BidstonObservatory, demolition, Heritage, JosephProudman, ListedBuildingConsent, NERC, News, Planning, Wirral, WirralBoroughCouncil on 8th May 2017 by admin. 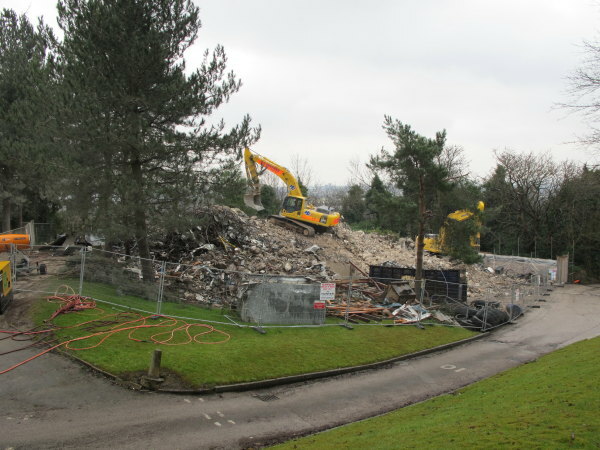 The Joseph Proudman Building has been reduced to rubble. I’ve posted a time-lapse video of how it happened. For a while, during a spell of dry weather, the lighthouse and cottages were covered in a blanket of dust — fine, sticky stuff composed of powdered concrete and who-knows-what that blew off the demolition site, turning our hair to straw and leaving a gritty taste in our mouths. When we complained, the demolition contractors promptly deployed a “dust reduction unit”, which sprayed a mist of water into the air, stopped most of the dust from blowing over us, and made our breathing easier. Eventually the rains should wash away the dust that remains. We had been worried about the effect the dust was having on the vegetation. But this morning, we saw the crocuses in bloom, a little late in the season, but apparently healthy. Soon it will be all over, and we’ll be waking up to the sound of birdsong instead of the rumble of heavy machinery. One evening a couple of weeks ago, we noticed from our dining room window some pretty lights twinkling through the trees to the east. We hadn’t seen these before, and wondered what they were. Then it dawned on us that we were looking at the lights of Liverpool at night. We will not miss the Joseph Proudman Building. People keep asking me what will happen next. In the short term, the site will be landscaped and new grass will be sown. In the longer term, we can only guess. We know that NERC want to dispose of their property on Bidston Hill. This includes the Observatory, the site of the former Braehead Cottage, and the leasehold of the site of the former Joseph Proudman Building (Wirral Borough Council own the freehold). However, Councils are fickle creatures, and Wirral Borough Council, like every other local council in the country, is under severe financial pressure and this shows no signs of letting up. The Council could benefit financially by selling the freehold of the Proudman site to a developer, and the only thing standing in its way is its self-inflicted Interim Planning Policy. So it’s probably only a matter of time before the council revises its planning policy to suit itself, and the Proudman site is sold to a developer. We have to hope that what’s put in its place is in keeping with the Observatory, Lighthouse and Bidston Hill. A residential development comprising a couple of sandstone cottages might be a satisfactory outcome. An eleven storey high-rise would not (although plans for such a monstrosity were actually drawn up only a few years ago). This entry was posted in Bidston Hill, Lighthouse, News and tagged BidstonHill, BidstonLighthouse, demolition, JosephProudman on 14th March 2013 by admin. The demolition of the Joseph Proudman building picks up pace with the arrival of heavy machinery on site. We’ve repositioned the webcam to give a better view of the proceedings. 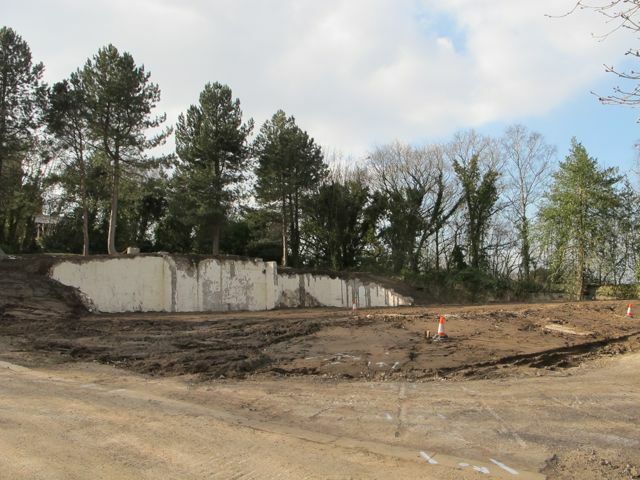 This entry was posted in Bidston Hill, News and tagged BidstonHill, demolition, JosephProudman on 9th February 2013 by admin. 4 Lighthouse Cottages, Bidston Hill is to be demolished. Not many people know that 4 Lighthouse Cottages, Bidston Hill, CH43 7RA, is actually the postal address of the Joseph Proudman Building. The Joseph Proudman Building was built during the 1970s on land which used to be the kitchen gardens of the Lighthouse Cottages. It was officially opened on 18 April 1979, and named after Joseph Proudman (30 Dec 1888 – 26 Jun 1975), CBE, FRS, Honorary Director of the University of Liverpool Tidal Institute. Joseph Proudman also gave his name to the Proudman Oceanographic Laboratory (POL), the research institute which occupied Bidston Observatory, the Joseph Proudman Building and part of the Lighthouse until its relocation to the University of Liverpool in 2004. POL is now part of the National Oceanography Centre. Few will be disappointed to see the Joseph Proudman Building disappear from the Wirral skyline. Amongst those few are fans of cold-war architecture and the well-intentioned Bidston Preservation Trust, who mounted a campaign to save the building as part of a longer-term strategy to protect the more important Bidston Observatory. They bought a few months for their campaign by applying to English Heritage to have the building Grade II listed. Wirral Borough Council, who own the freehold of the Proudman site, were forced to postpone their decision on whether to consent to the demolition until after English Heritage had considered the matter. To cut a long story short, English Heritage rejected the application at the initial assessment stage, the Council finally gave its consent, and the live-in guardians who have kept the Proudman Building secure for the last seven years have been given notice to quit. The demolition works are scheduled to start on Monday 26th November 2012, and are expected to take 10-12 weeks. 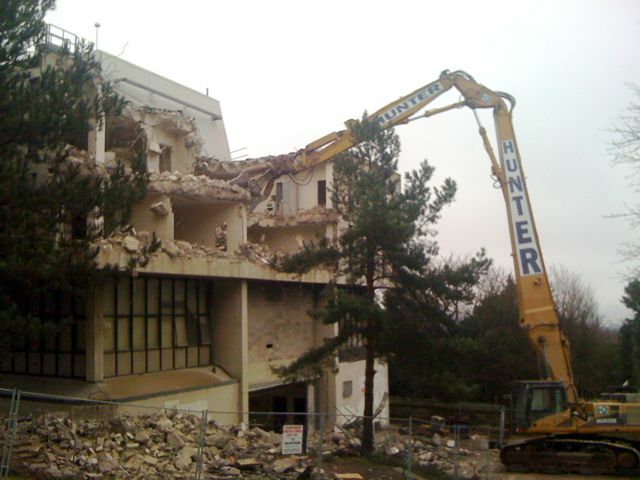 The contractor undertaking the demolition is Hunter Demolition. Their tag line is “creating new horizons”. If all goes to plan, you will be able to follow the action on the web thanks to wirralcam.org. A webcam mounted on the east face of the lighthouse will give a panoramic view of the proceedings. At the beginning, you will see the Joseph Proudman Building. At the end, you will see the iconic Liver Buildings in the distance. Creating new horizons indeed! This entry was posted in Bidston Hill, Lighthouse, News and tagged Bidston, BidstonHill, BidstonLighthouse, demolition, EnglishHeritage, JosephProudman, NERC, webcam, WirralBoroughCouncil on 19th November 2012 by admin.